Global map of Mars showing a growing dust storm as of June 6, 2018. The map was produced by the Mars Color Imager (MARCI) camera on NASA's Mars Reconnaissance Orbiter spacecraft. 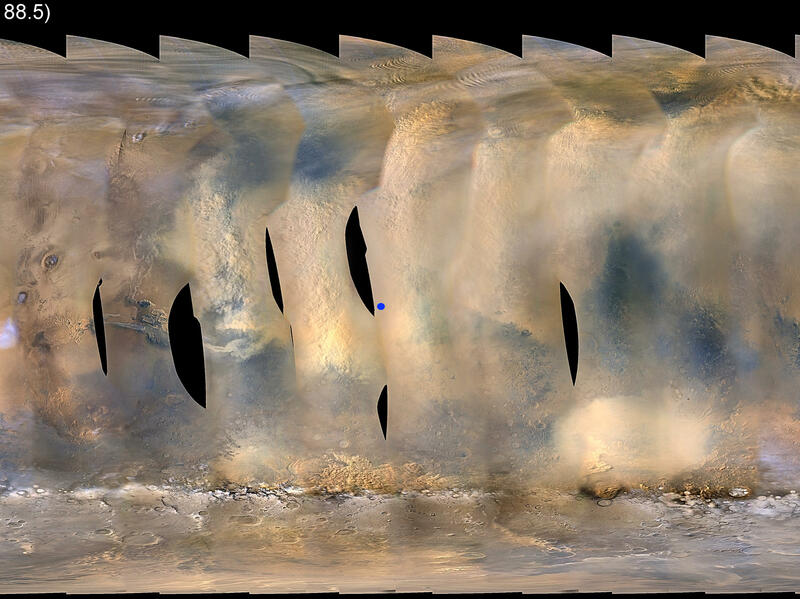 JOE PALCA, BYLINE: On May 30, NASA's Mars Reconnaissance Orbiter spotted a dust storm - a storm that was heading toward Opportunity's location near the equator. Over the next few days, the storm intensified. And by last Sunday, the power from Opportunity's solar panels had dropped to a trickle. JOHN CALLAS: I made the decision to declare a spacecraft emergency because there wasn't enough energy for the rover to sustain activities. PALCA: That's Opportunity project manager John Callas of NASA's Jet Propulsion Laboratory. Callas says the spacecraft has basically gone to sleep. CALLAS: These are just historic low energy levels for the vehicle. PALCA: Opportunity has been hard at work on Mars since January 2004. It's found signs that water once flowed on the now parched planet. Opportunity was designed to operate for at least 90 days on Mars. Fourteen and a half years later, it was still going strong. CALLAS: Prior to this storm, the vehicle was in, actually, remarkably good health. PALCA: The main danger to the rover at this point is the cold temperatures on Mars. It goes as low as 36 degrees below zero. Opportunity's twin rover called Spirit stopped working in 2010 because of the cold. CALLAS: The big difference between now and what Spirit went through back in March in 2010 is Spirit was going through winter. So the temperatures were a lot colder, and there was a lot less sunlight. PALCA: Now it's late spring on Mars, so the temperatures will actually be warming. And as it turns out, as bad as the dust is for the solar panels, it's good in a different way. Rich Zurek is chief scientist for the Mars program office at JPL. RICH ZUREK: When you have such a thick dust haze, the nighttime temperatures are actually warmer. And that's helping out Opportunity. PALCA: If Opportunity does survive the cold temperatures, project manager John Callas says the solar panels should be able to recharge the batteries when the dust clears. CALLAS: Even though these batteries are 15 years old, they still have about 85 percent of their capacity. They are really the finest batteries in the solar system. CALLAS: I mean, I only wish my cellphone battery had half of that. PALCA: Still, until the batteries do recharge, everybody on the rover team will be nervous. PALCA: We should know more in a few days. Joe Palca, NPR News.